President Yoweri Museveni is back home from a five-day foreign visit to Eritrea where he paid a two-day State Visit and Turkey where he joined other world leaders for the 2nd International Conference on Somalia. President Yoweri Museveni and President Issaias Afwerki of the State of Eritrea have urged the governments of Sudan and that of Southern Sudan to overcome their differences through good faith dialogue and lay the basis for solid and mutually beneficial relations for the good of both countries and the region as a whole. President Yoweri Museveni has stressed that the historical mission of the current generation of Africans and the next one, is to resist marginalization, manipulation and dominion to ensure the future of the continent. President Yoweri Museveni has arrived in Asmara for a 2-day State Visit at the invitation of President Isaias Afewerki of the State of Eritrea. President Museveni, who is accompanied by his wife, Mrs. Janet Museveni, was received at Asmara International Airport, by his host President Afewerki. President Yoweri Museveni has left for Asmara on a 2-day State Visit to the State of Eritrea at the invitation of President Issaias Afewerki. The President was seen off this morning at Entebbe International Airport by the Vice-President, Mr. Edward Kiwanuka Ssekandi. 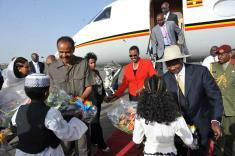 President Yoweri accompanied by First Lady, MP and Minister for Karamoja Janet Museveni have arrived in Eritrean Capital Asmara on a State Visit. The President was received by his Host President Isaias Afewerki at Asmara International Airport and later hosted his visitors at a State Banquet at Asmara Presidential Palace on 29/5/2012.